A couple of years ago we carried out some in depth tests of the Valiant Heat Powered Stove Fan. Now in the winter of 2014/2015 Valiant have a new stove fan – the Valiant PremiAIR 4 on the market which we have been testing through December 2014. Pictured below on the left is the original FIR300 stove fan and on the right is the new PremiAIR 4 Stove Fan (FIR361). 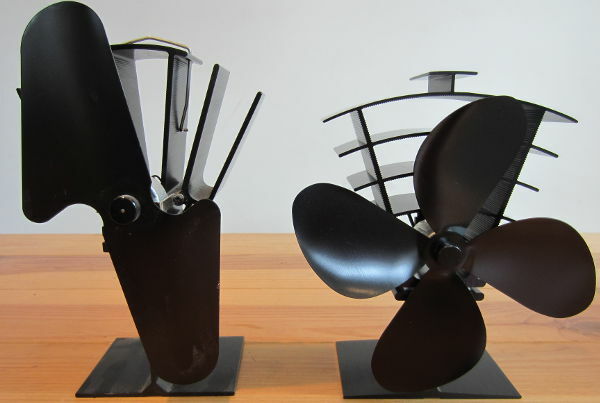 The obvious difference between the two fans is that the new PremiAir 4 has four fan blades instead of two which should increase the air flow, and also has a greater surface area of heatsink which should increase the power available to the motor via the Seebeck Effect. A heat powered fan sits on top of a stove which heats up its base. The difference in temperature between the base and the relatively cool heatsink at the top of the fan body results in electricity being generated by a Peltier module sandwiched in the middle. This powers a motor which turns the fan and should drive the hot air from the stove into the middle of the room instead of it rising to the ceiling. This should make the inhabitants of the room feel warmer, and so they will use less fuel in the stove and/or be able to run any radiators in the same room at a lower temperature while still feeling comfortable. As with our tests on the original fan, we still have to overcome the difficulties of running a good scientific experiment when there are so many different variables in play. To minimise problems in interpreting the collected data we ran our experiments in the evening when the outside temperature was falling in a room with the door kept closed. Therefore any sudden temperature rises measured will be because of the effect of the fan, or from adding more fuel to the stove. By fuelling the stove and then waiting for the temperature of the room to rise and plateau, we can then put the fan on the stove measure its effect. Repeating this process multiple times enables more data to be collected to create a more complete picture of what is going on. We used a 4kW rated multi-fuel stove in a room which is 3m x 4m x 2.8m (high). To generate more data this time around we used three ds18b20 digital temperature sensors connected to a WiFi connected Raspberry Pi Model A+. We wrote some simple datalogging software on the Raspberry Pi to read the sensor temperatures once every minute, and also installed a web server so that we could easily monitor the data in realtime with a mobile phone browser. NEW Click here for our article Raspberry Pi Experimental Datalogging Setup which explains how we set up our datalogger (including the source code) and webserver. 1. Just above the mantelpiece to measure the temperature of the air rising from the stove toward the ceiling. 2. 2 metres away from the stove at a height of 2 metres to measure the temperature just above head height of a standing person. 3. 2 metres away from the stove at a height of 1 metre to measure the temperature at the chest and head height of someone sitting on a sofa in front of the stove. 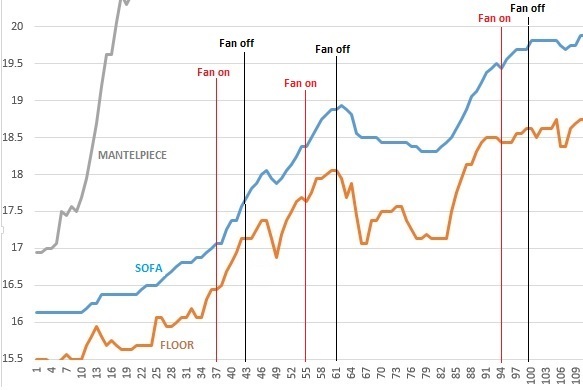 What we expect to see (if the fan is effective) is that when the fan is on, the mantelpiece sensor temperature drops and the temperature of the other sensors rises. The effect should be quite rapid as the sensors are quick to respond to temperature changes and warm air should be hitting the sensors immediately when the fan gets up to speed. On all three occasions that the fan was put on the stove, there is an increase in temperature on both sensors of around half to one degree Celcius over where it would otherwise have been. This is the measured benefit of using the fan on this particular stove, in this particular fireplace, in this particular room. Similarly, when the fan was removed, the temperature fell back again – most notably on the second occasion the fan was put on the stove and subsequently removed. The sudden drop in mantelpiece temperature shows the when the fan was put on the stove. 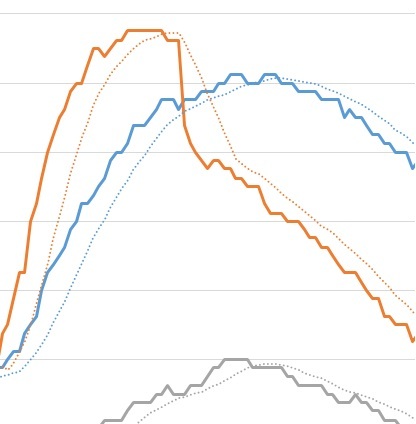 There was a one degree temperature rise at the sofa, and a similar rise at the floor level with the temperatures plateauing at these new higher temperatures after around five minutes. It then took a further five to ten minutes for those sensors to find themselves back down at the level they had been before the fan was put on the stove (and during which time the stove had cooled considerably. Therefore the sofa and floor sensors were certainly maintained at a higher temperature and for longer than they would have been without the use of the fan. Although a one degree increase does not sound very significant, you can certainly feel a very real difference when the fan is on. 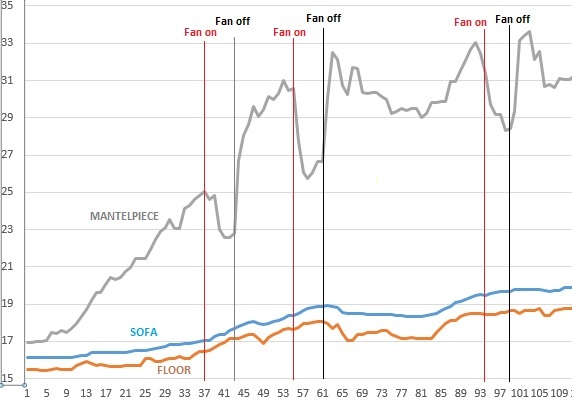 If you direct the fan toward one particular seat on a sofa for example, the further you move away from that seat along the sofa, the cooler you feel while still sitting in front of the sofa and at the same distance away from it. It is that feeling which will keep you sitting happily on the sofa instead of getting up to add fuel to the stove or turn on or up the radiators. As with the Valiant FIR300 previously tested, the PremiAIR 4 is very robust, effectively silent in operation, and attractive. It is still quite an expensive purchase, but should pay for itself multiple times over its lifetime. There are alternative not so well made heat powered stove fans on the market starting from around half the price of the Valiant models, but to pay for itself one of these fans needs to run reliably for a good few years. Our original Valiant FIR300 is still running and looking like new despite being bounced off a slate hearth tens of times and otherwise mistreated (when it becomes a child magnet over the summer months while the stove is not in use).